If your goal is to become a YouTube star, you might be a bit late to the party: it’s really hard to get noticed these days — too competitive. Stardom will take years of hard work to achieve because of the number of channels users have to choose from. That’s not to say, however, that you cannot achieve other, more tangible goals on YouTube. It’s an excellent venue for business owners and marketers. Here’s one thing about reputation management on Google: You’re never finished. That being said, YouTube is a perfect platform to host your video product overviews: it’s free, it offers the additional benefit of ranking well in Google, and it provides additional exposure to your products through their huge community, allowing people to discover your business via native search and suggested videos. Imagine your video being suggested next after your competitor’s product review. 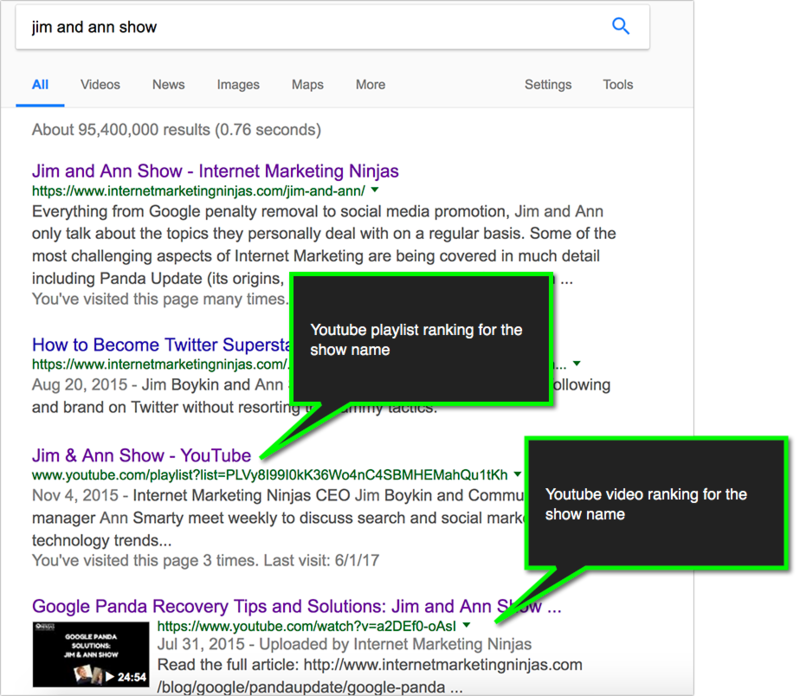 Imagine your competitors’ customers stumbling across your video comparison when searching for an alternative service on Youtube. Again, it’s not easy to reach the YouTube Top 10, but for specific low-competition queries it’s quite doable. Note: To be able to build traffic from inside your YouTube videos, you need to build up your channel to 10,000 public overall views to qualify to become a YouTube partner. 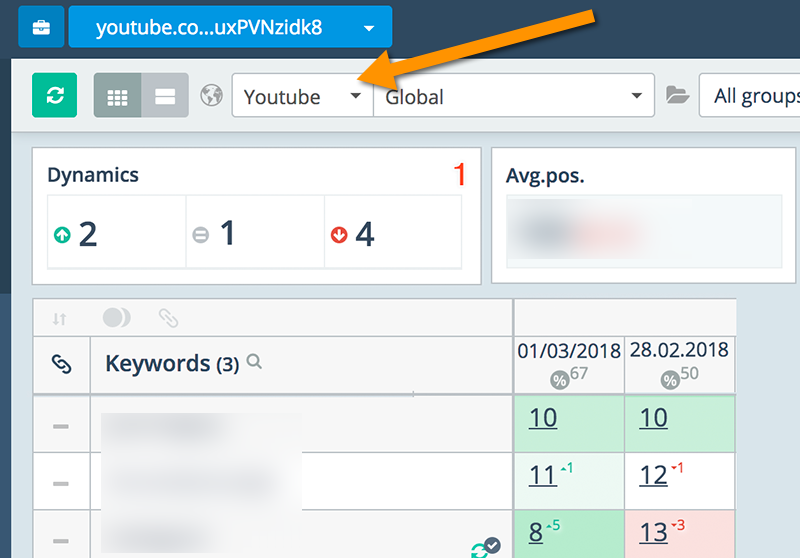 Once approved, you’ll be able to add clickable links to your site from within your videos using cards and actually build up your own site traffic via video views. When creating your roadmap, keep your goals in mind, as well. 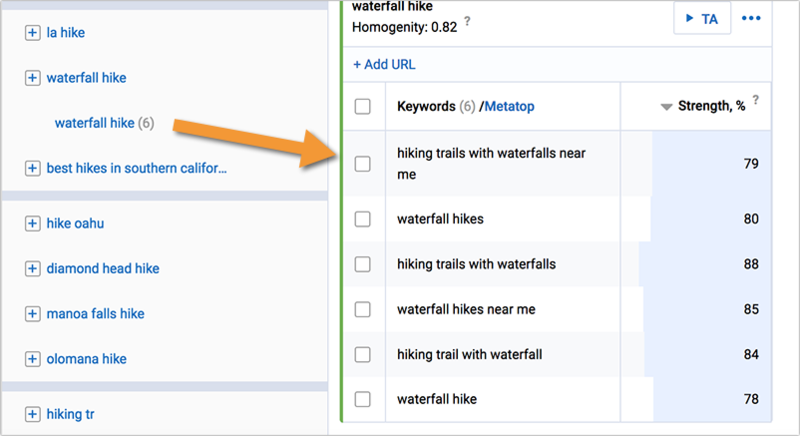 Some videos, such as testimonials and product reviews, won’t be based on your keyword research but still need to be included in the roadmap. Video production can be intimidating, especially if you have a modest budget, but these days it’s much easier and more affordable than you’d imagine. 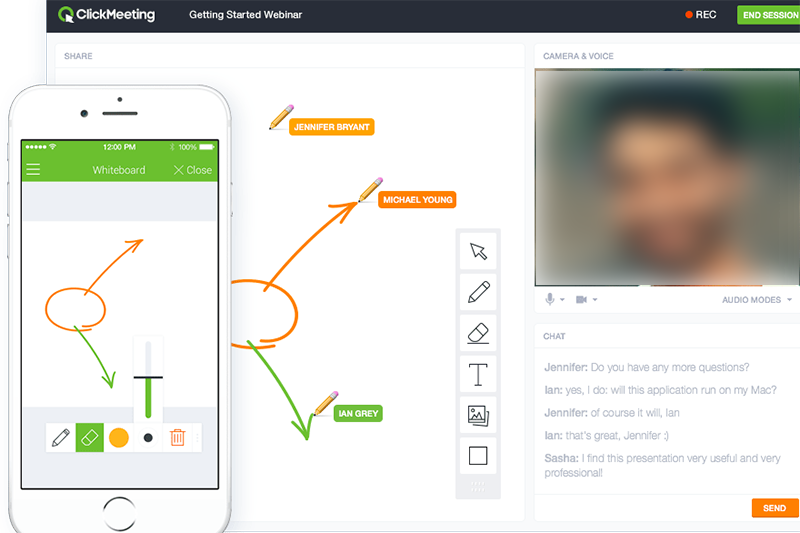 Create beautiful visual testimonials, promo videos, and visual takeaways using Animoto ($8/month): You don’t need much time to learn to use it; it’s very easy and fun. Create video tutorials using iMovie (free for Mac users): It will take you or your team about a week to properly figure out all its options, but you’ll get there eventually. Another great idea is to reach out to YouTube bloggers in your niche. Some of them will be happy to work for you, and as a bonus you’ll be rewarded with additional exposure from their personal branding and social media channels. There’s lots of talent out there: just spend a few weeks searching and reaching out! That being said, driving “deep” views to your videos is crucial when it comes to getting the YouTube algorithm to favor you. Avoid auto-plays: Don’t screw up your YouTube stats! YouTube pages auto-play videos by default, so if you share a YouTube URL on Twitter, many people will click and immediately leave (social media users are mostly lurkers). However, if you share your page with the video embedded on it, it won’t play until the user clicks to play. This way you’ll ensure the video is played only by people who seriously want to watch it. 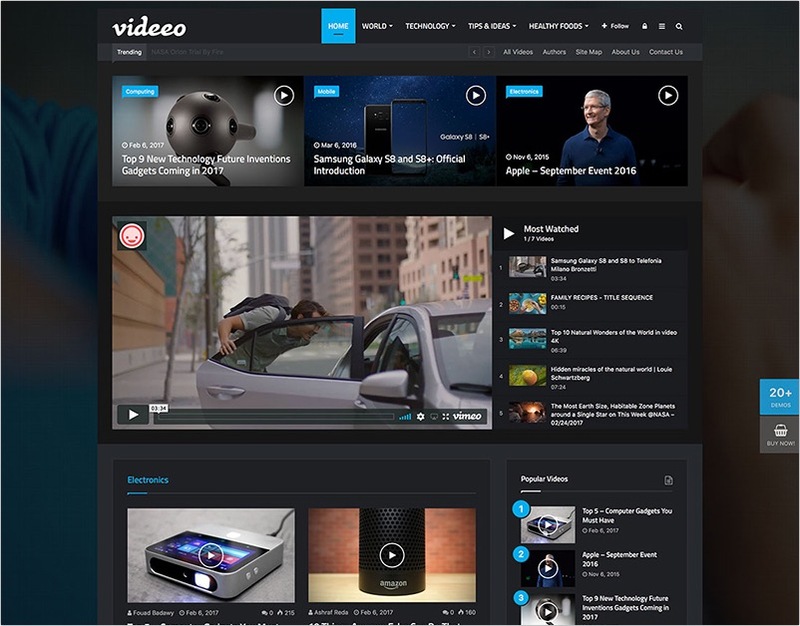 Invest time and effort into your own site promotion instead of marketing the youtube.com page: Promoting your own site URL with the video embedded on it, you can rest assured that more people will keep interacting with your brand rather than leave to watch other people’s videos from YouTube suggested results. 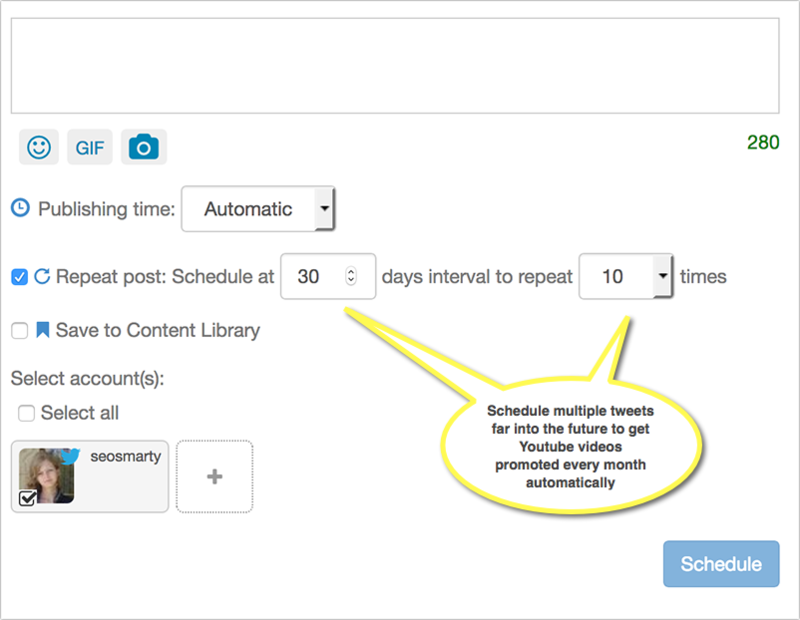 Use recurring tweets to scale video promotion. There are a few tools you can try, such as DrumUp. Schedule the same update to go live several times on your chosen social media channels, generating more YouTube views from each repeated share. This is especially helpful for Twitter, because the lifespan of a tweet is just several minutes (between two and ten minutes, depending on how active and engaged your Twitter audience is). 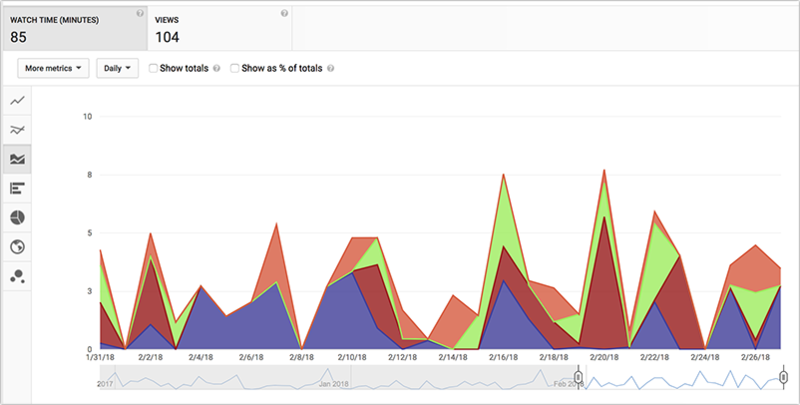 With recurring tweets, you’ll make sure that more of your followers see your update. 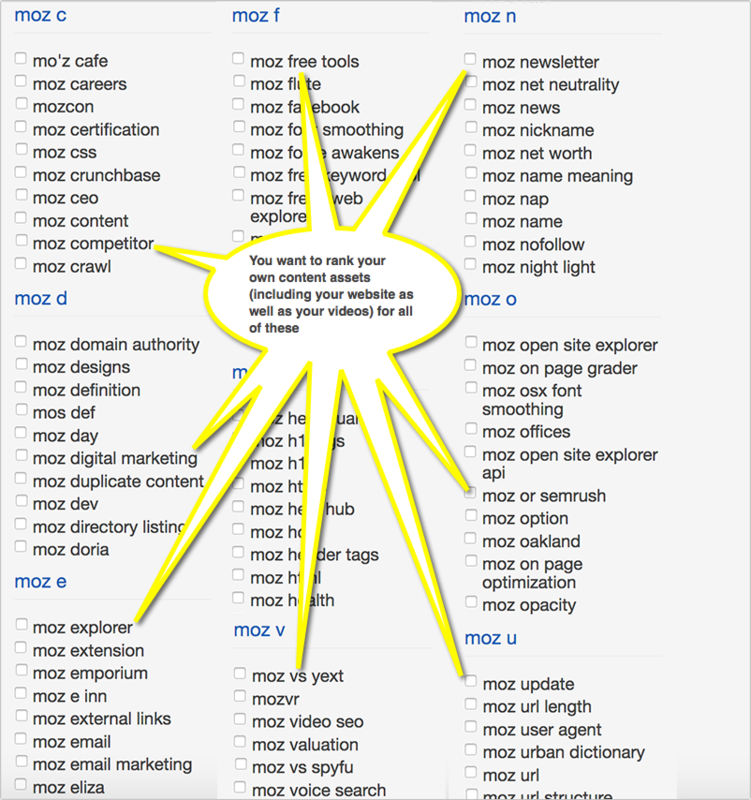 You’ll see traffic sources, i.e. 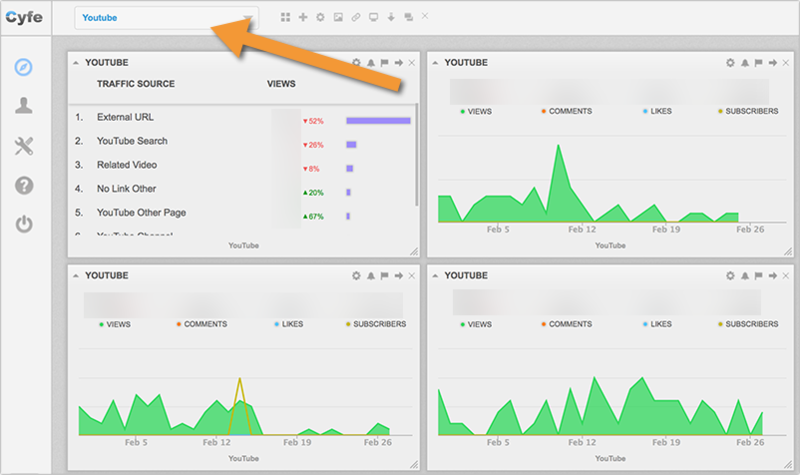 where the views are coming from: suggested videos, YouTube search, external (traffic from websites and apps that embed your videos or link to them on YouTube), etc. 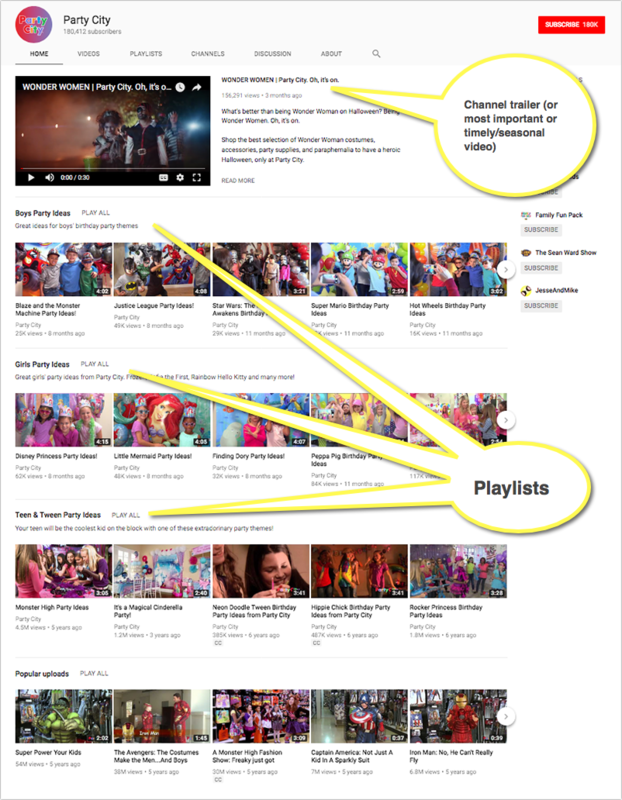 The number of times your videos were included in viewers’ playlists, including favorites, for the selected date range, region, and other filters. This is equal to additions minus removals. Building a YouTube channel is hard work. You’re likely to see little or no activity for weeks at a time, maybe even months after you start working on it. Don’t let this discourage you. It’s a big platform with lots of opportunity, and if you keep working consistently, you’ll see your views and engagement steadily growing.